WHO THE HELL IS HEIDI LITTLE? WHEN MY FRIEND, ARTIE KORNFELD “THE FATHER OF WOODSTOCK” KEPT TALKING ABOUT HEIDI LITTLE ON HIS SERIUS RADIO SHOW AND WROTE ABOUT IT ON HIS BLOG, I KNEW SHE HAD TO BE SPECIAL…SHE WAS…SHE IS, AND SHE ALWAYS WILL BE. NOT SINCE I REPRESENTED JONI MITCHELL’S PUBLISHING IN THE EARLY SEVENTIES HAVE I BEEN SO IMPRESSED BY A BODY OF WORK FROM SOMEBODY SO YOUNG…AND SO CANADIAN. “I have always had hope and our future nestled in my heart. I have always spoke and acted out against injustice on all levels. Our hearts and minds have seen and taken in so much devastation, killing, brutality. And all the while I wrote the songs. Heidi Little has composed a strong anthem that inspires people to action in some means. Occupy Together is a movement that, like Artie, I’m still reading about more than understanding distinctly. From the fervent activity in U.S. cities and towns, the message speaking to me says ‘do something’. In the 1960s, I remember when people simply did not discuss politics ‘out loud’ for fear of offending someone. And yet, Heidi’s song is universally applicable to any political movement, whether purposeful in intent, or general and welcoming to a cause. People have long forgotten the power of one. One person, one vote, one opinion expressed out loud. It may be one your best friend or neighbor doesn’t understand or agree with but it’s out there, for them to consider. If people would, as Heidi sings (quite well by the way), let themselves shine, we’d have more leaders and less followers, that good old spirit of independence from a few hundred years ago rising up and moving people out of their La-z-boy recliners and to the polls, no matter what side of an issue. Heidi, well done, more of her songs please, Artie. Thank you for speaking up. YOU ROCK! Every time I listen to “Shine” I feel better. Thank You for Bringing Love, Hope and Joy to the World Heidi. What this world needs is not to be reminded of the chaos and suffering in the material world but a new way of existence, of letting go of fear and living from the heart and activating the kundalini of joy and enlightenment. My sincere best wishes and divine blessings for your cause. The light shall set us free ! Spread the word, quality shines through in everything you do! Great voice, great songs, great person! grow to be a creative spirit that must be heard and seen. If you have not reached our to her, music, blog, website, or seen her live, dont delay, take adavantage of the small venues now, because I guarantee you she will be moving into something very big this year! I have been in the music industry for over 20 years now and Heidi Little is one of those rare artists, that really cares and produces work that will hold its creative integrity, music and message for years and years. It really comes down to writing from your inner self or terms many people use “belieivable” “authentic” , songs you can listen to today and still listen to years later with your kids and thier meaning will still inspire and console you. I had the pleasure of interviewing Heidi on my very brief but very positive radio show in the North Country. I found her demeanor to be so very calm and refreshing. If only every conversation could be this easy. 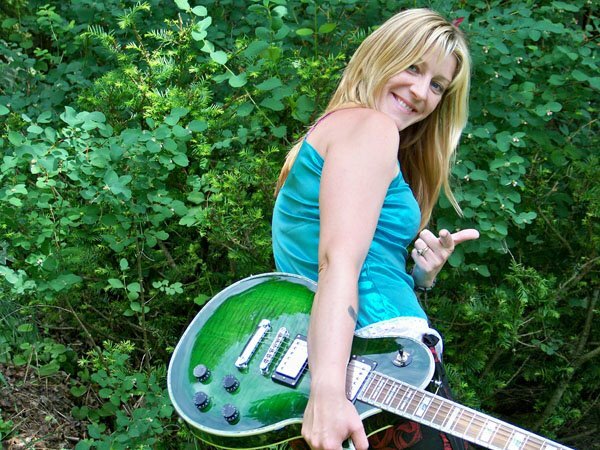 Heidi’s fervor for life comes through in her music. Simply put: She speaks up! As a musician myself I know what that means; for honesty in music translates and resonates. That is Heidi Little! I recently saw Heidi and her stellar back-up band perform at The Down Hill Grill in Saranac Lake, NY. Before the first chord was struck I already knew it would be a great night. I had only previously heard her new tune “Shine” but that was enough for me. A powerful, angelic voice along with equal parts passion and desire to entertain will win every time! Rock on, Heidi! Heidi is a great singer and songwriter. Catchy tunes, positive message, beautiful voice and playing…you can’t beat that! I have been a fan of Heidi Little’s music since I first hard it – and I don’t think I am saying something she doesn’t know by stating that I have also always been a fan of Heidi Little!! She is a shining light and her music never fails to entertain me, and inspire me. Thanks, Heidi, and keep up the great work. Heidi is a great talent – such a pleasure to write with – so many positive vibes – creativity personified – Heidi shines!!!!!!! there are people in this world who bounce with light footsteps of grace, never leaving anyone behind, making the world feel that much brighter, and bringing that much more hope to those who want to feel they matter. heidi is that kind of mystical, musical woman. her songs, enriched by her beautiful voice, give you the feeling that there is great purpose inside EACH of us….that we are connected…and the great truth is that this profound wisdom she has is just an extension of her innate ability to transform what is her natural condition: a muse seeking serenity and leaving her song as a gift to us all. In love and light Heidi Little. « YOUTUBE…THEY’RE PLAYIN’ MY SONGS, BUT THEY’RE DOIN ME WRONG!